From the desk of Dr. Bryan Schuetz, The Columbus Chiropractors at Capital City Chiropractic, Worthington, Ohio. Disc Bulgeis very common cause for acute low back pain. 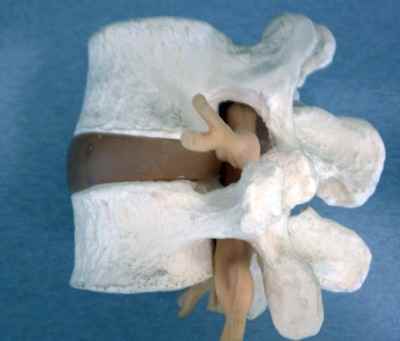 A disc is a shock absorbing structure that is situated between two vertebrae in the spinal column. They are primary composed of collagen and water. 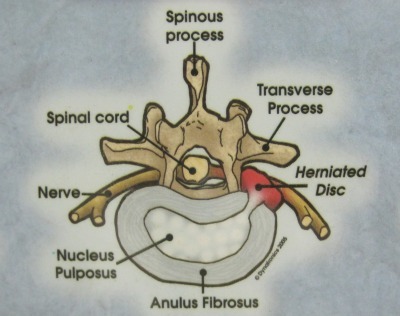 The disc has two distinct regions that each perform a specific function in the spine. The annulus fibrosis is the outer portion of the disc. It is made up of several layers of collagen that are arranged in a pattern much like the inner metal fibers of a radial tire. 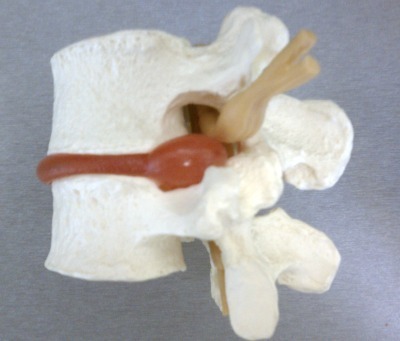 This configuration gives strength to the disc structure. The inner portion of the disc is called the nucleus pulposis. The nucleus is much like a fluid filled marble that assists in movement of the spinal bones above and below the disc. When there is an injury of the disc it causes a tearing of the annular fibers. This allows the nucleus pulposis to migrate towards the edge of the disc causing a bulge or herniation. The normal disc is demonstrated above. It is contained within its normal border and the space where the nerve exits the spinal cord is intact (intervertebral foramina). When a bone is out of normal alignment and pressure is applied, it can cause the nucleus pulposis to herniate, creating a bulge. You can see the bulge in red as it encroaches on the spinal nerve (yellow). to properly align the structures and reduce the abnormal pressure on the disc that caused the problem. at the rate of 20 min. per hour without direct contact to the skin. therapy to alleviate the disc bulge by creating a negative pressure on the disc space so that the nucleus pulposis can migrate back to its normal position. once the acute phase of the injury is over and working into a home strengthening program to avoid future problems. by your medical doctor for short term relief of inflammation. We work with your medical doctor to assure that you get the fastest relief possible. is a great way to help with the pain of a disc bulge. I like to recommend that patients who use spinal decompression therapy use inversion therapy at home while using decompression in the office and after decompression therapy is completed. I recommend the Teeter Brand Inversion System because it has a long track record of safety and effectiveness.